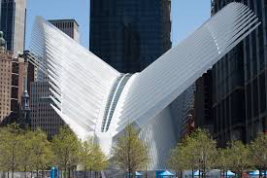 World Trade Center | Custom & Private New York Tours, Inc.
We’ll stand before the memorial pools that sit on the footprints of the two fallen towers, hear a presentation of the symbolism, design features of “Reflecting Absence” the name of the reflecting pools. It’s an obligation to pay homage to our fallen and “pay our respects.” You’ll visit the survivor tree, a cherished symbol of the struggle for life. If you’ve never been here it’s a must visit. Why has it taken so long? The Santiago Calatrava Transportation Hub with its $4 billion price tag is a symbol of Phoenix rising from the ashes. St. Paul’s Cathedral (1766) remained unscratched, “The Little Cathedral That Stood” as it is called now and then. The work is still ongoing and is becoming a magnificent recreation and symbol of life’s struggle for ourselves and our country. Visit the 911Memorial museum and the observation deck at the top of One World Trade known as One World Observatory. Everyone should include a visit if you have the time to do so during your visit.